Want to know what I believe is going to happen in 2013 for your home business? Want to see what 2013 is going to look like for the network marketing profession? Are you READY for these success predictions for mlm? I want to wish everyone a HAPPY NEW YEAR and a prosperous 2013! It was a LONG YEAR in 2012 for a lot of folks and most are glad to see the year to be behind them. Are you one of them? I am and I am so glad that 2013 is here! Things are going to change for the home business network marketing work at home profession this year! And I DO mean change! But not bad change- but GREAT change! And those changes will play out and work FOR the profession, not against. Most leaders would agree that things MUST improve and increase in 2013, and you will see that this year. Many people I have talked to are in agreement that we are headed into a great year. I believe we are headed into an incredible year. And I DO mean incredible. I have never gone out on a limb before with predicting anything, but this year is different. it is unlike any year that we have seen in our lives and that is why that these 5 predictions will prove to be TRUE for 2013. 1. Because of the enormous TAX INCREASES coming in 2013, people will be looking for more income and revenues then ever before. President Obama, agree with him or not, has the single largest tax increase in nearly 50 years to hit January 1. And it impacts 80% of the nation;s households, and this does NOT include Obamacare. So with those taxes coming and reducing the household income of 80% of Americans, there will be a TON of folks looking for new revenues and more income. This opens up conversations with people that last year were not open to talking about a secondary income or their own business. but they are NOW. And you will find that the anxiety of the tax increases will accelerate people looking for some relief from this enormous burden that will be on households. 2. There will be more LAYOFFS in 2013 because of the economy and people will be searching for options and alternative sources for income and security. There will be a lot of either layoffs or people going part time in businesses and this alone will force people to want to seek more income. This will work in the favor of all home businesses and recruiting will be on the rise . There will be people that will not want to put themselves in that position again and will look at going full time with their own business to create their own security. THIS will be a game changer in 2013. 3. Because of the NEGATIVE MOOD of the nation concerning the economy, there will be people searching for a more positive culture or environment. 72 % of those polled recently in a USA Today poll, had a negative view of 2013 regarding our economy. The mood of America seems to be in a “funk.” We all know that the culture of the home business profession is POWERFUL and POSITIVE. There will be more people seeking out a more positive environment then what they see at work, and around their friends. What we must do, is to tell prospects that we have a powerful personal development culture that you can double or even triple your income the first year with some of the most powerful people in the world and they need to be a part of this. And this will open up the eyes of those seeking this more powerful space for their life. 4. The BUSINESS MODELS are changing in America, and more and more people will be seeking more updated and social / mobile business models. Our country is changing in many ways- some good and some, well, not so good. But the changing business models are driving the marketing changes that are happening. More and more people are looking for more updated and ‘today” marketing models and our profession has the opportunity to take advantage of that- from home. Social media changed the game of marketing, and we know that. but Mobile Media is going to accelerate the marketing scope of what we can do from home, and there will be millions of people seeking these types of more progressive business structures. 5. People are tired of the last 4 years of a down economy and will make a decision that they must DO SOMETHING and no longer wait on Washington to do something. People are TIRED of being in “economic limbo.” Many people today are going to make a life changing decision for their family, and start a business from home. Studies have shown that people are tired of the path they have been on economically, and are going to do something different in 2013. This is a perfect time for us to move forward and introduce the profession of home business in a more aggressive manner to people that are loking for it. 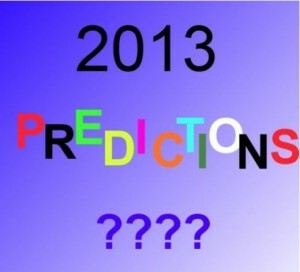 These are 5 predictions for 2013 for the mlm network marketing home business profession.